Want to make a simple statement with your Valentine decor? 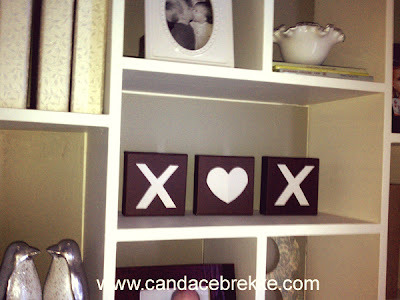 Take any three blocks and add a XOXO with paper cutouts. It literally took me a few minutes. I painted three small canvases prior (you could use wood blocks or whatever you wish) and then cut out the X and heart from plain white paper. I didn't even modge podge them on, because I plan to paint something different on the canvases later. In the meantime, they made the perfect statement on my shelf. Try using 'non-traditional' Valentine colors to give it a more modern touch. Extra hint: Keep some of your Christmas decor through the Valentine season by adding this cute little twist. The winter penguins seen on the bottom left of the photo were bought on sale after Christmas. For the month of February, I simply turned them to face each other for a Valentine smooch!